Do decentralized energy strategies promote women’s involvement in energy governance? Do decentralized energy strategies promote women’s involvement in energy governance? How can the choice of household fuel promote energy justice in developing countries? These questions illustrate some of the themes discussed at the workshop for the launching of the “Optimal Energy Efficiency Strategies to Promote Energy Justice and Low-carbon Development in West Africa” project. This workshop takes place March 6 – 8, 2018 in the capital of Senegal and will be attended by an Econoler delegation comprised of Laurent Jodoin, Kawther Lihideb, Roger M’Gbra N’Guessan, Joelle Matte, Laurent Kossivi Domegni and Victorien Ague. This research project is funded by the International Research and Development Center (IDRC) and will be implemented by Econoler and ECREEE. This project will employ a multidisciplinary approach to determine which energy policies should be favoured to promote energy justice for women in rural and peri-urban areas in three West African countries (Benin, Senegal and Togo). The project will run for three years and will involve a series of field research activities. Research partnerships have been established with the University of Lome (Togo), the University of Cheikh Anta Diop (Senegal), the Universities in Public Health and Epidemiology (Benin), the University of Abomey-Calavi (Benin) and the University of Parakou (Benin). 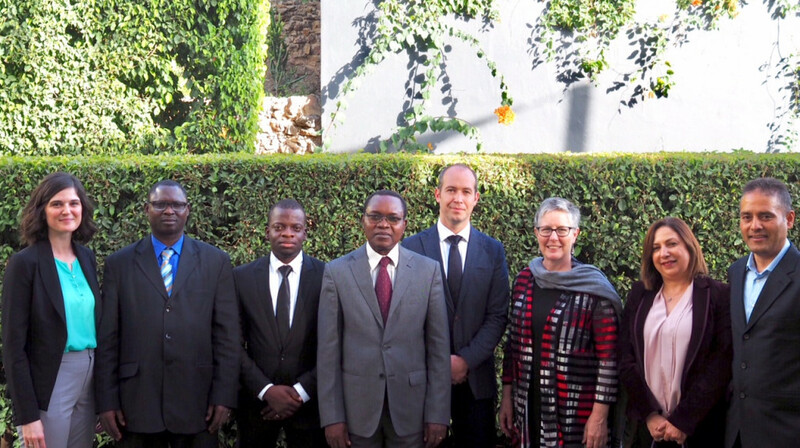 Photo: The Econoler and ECREEE team (Ibrahim Soumaila) with IDRC representatives (Bhim Adhikari and Kathryn Touré).